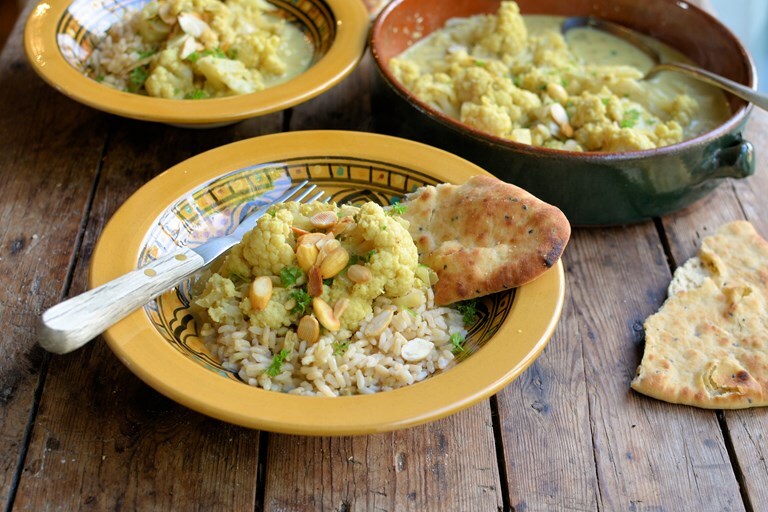 Karen's creamy cauliflower curry recipe is just the ticket for a chilly winter night. Flavoured with a mix of aromatic spices and enriched with yoghurt and almonds, this vegetarian pasanda recipe is rich but not heavy, and can be easily whipped up in 30 minutes. When I am not in the mood for a fiery curry, than a pasanda always fits the bill; a pasanda is a mild, creamy curry made with yoghurt, almonds and fragrant spices such as garam masala, ginger, cumin and coriander. I’ve also seen recipes for pasanda with tomatoes in the base too, but the creamy almond version is my favourite. It’s a popular dish in northern India and Pakistan, with the title being a variation on the Urdu word for 'favourite' which is pasande which is thought to refer to the cut of meat that is usually used in the curry, which will be a prime cut, or a favourite cut. My version of a cauliflower pasanda is based on the meat version, but is gluten-free and vegetarian, as well as being low in calories and healthy. I love the humble cauliflower and often cook with it – favourite recipes that often find their way to my kitchen table, are cauliflower steaks, cauliflower pizza and a beautiful whole roasted cauliflower in a spicy sauce. I also love cauliflower soup and spiced cauliflower too... I find that it’s such a versatile vegetable, and there’s more to serving it than dousing it in cheese sauce, nice though that may be! The recipe below yields a large meal for four people, when served with rice and naan bread, and it can be made the day before you plan to serve it, allowing the flavours and spices to permeate the cauliflower thus enhancing its flavour – just reheat it gently over a low heat and serve.